Villa with a private garden surrounded by the property's vineyard and olive trees. 10 mins walk to the sea. In a key position for excursions. Castellammare del Golfo, 10km. Palermo, 60km.There are two double bedrooms each with it's own bathroom. Kitchen, living space, dining space, two verandas both covered with one social table each for outside breakfasts, lunch and aperitifs. Complete privacy, great for families with young children or couples. Hi, I'm Guido the landlord of the Vine House, a rural house with modern and antique interiors immersed in a 10.000 Sq/mt lot. I'm married with a 8 years old kid and i'm sure this is the best fit for either a romantic or family week! I've actually built this house, and doing so i've realized one of my dreams as a child. The lot it extends for 10000 sq/mtr and the house's north veranda looks a beautiful vineyard. The house is both EASY to Access and VERY Private. Enjoy local farmers products and some of the best Italian wines. Every other properties have extensions of the order of 1 tenth and or are squeezed into some condo type of setting. Enjoy the pleasure of a sunset aperitivo, with the sea breeze in front of your vineyard, in absolute privacy! and with the grill ready on the backyard of course! Scopello is a magic place, you'll immediately start living your own time forgetting about daily routines. Cleaning / Towels / Linen / Maid service: Cleaning service on arrival, towels and linen are included. A very good base for visiting the outstanding national park excellent walks, beautiful flowers (Orchids) and lovely bays for swimming in. Nearby market for all essentials with friendly bar. Close by in Scopello are good resteraunts especially Nettuno with great recommendations for its fish specialities and wine. Worth visiting are the salt museum at Trapani, hilltop town of Erice, Capo San Vito and Castellamare del Golfo. The house is well equiped with two nice terraces for relaxing or eating outside. Having visited Scopello last year and fallen in love with the area we decided to return for our second family holiday this year. The whole booking process was very smooth and Guido was incredibly helpful throughout ~ it certainly helped that his English is perfect! The villa itself is charming and ideally situated ~ very close to the village of Scopello, whilst feeling very private. The kitchen is well equipped and the layout of the rooms is perfect for families or two couples holidaying together. The bedrooms are at opposite ends, so you're not sleeping on top of one another and each has its own bathroom. All very clean and comfortable. The views of the hills all around you and the vineyard at the front are fantastic. It's a really beautiful part of the world, the beaches in the Zingaro, San Vito lo Capo and Favignana, the ruins at Agringento, Segesta and Selinunte and the views from Erice are all definitely worth a visit. The food is great, with 3 excellent restaurants in the village catering to all price ranges and you can also pick up amazing sandwiches and arancini from the brilliant bakery. We just had a another great holiday and would definitely love to stay again. 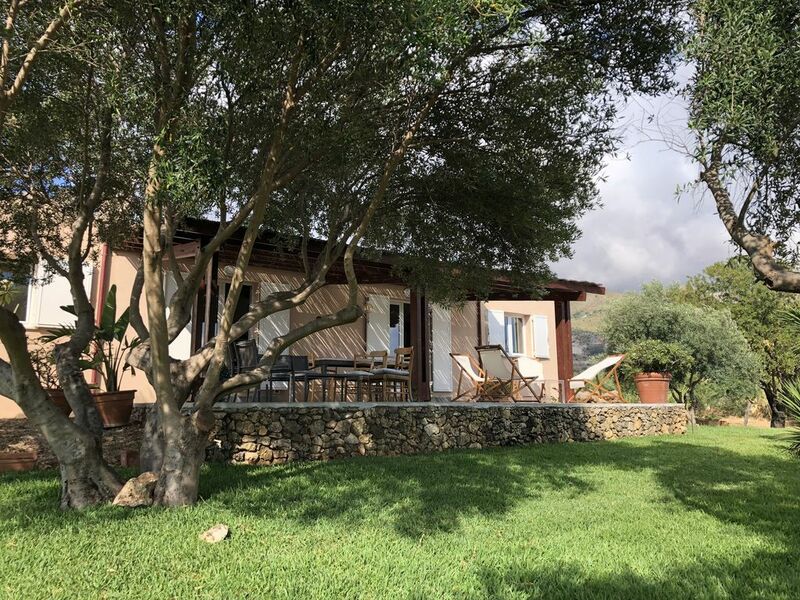 This is a charming and rustic property in a lovely location -vineyard to front, side and rear with a a rugged mountain backdrop . Clean and well equipped - airy and spacious inside with four external doors to keep the air flowing. Inside the interior was attractive and well maintained. Separate bathrooms/bedrooms at either end so lots of privacy if two couples sharing for example. The road is 120 metres away to front but all was largely quiet the week we were there (mid September) so, for Scopello, this feels a peaceful private and secluded location. We would emphasise the feeling of total privacy. Given local facilities it was easy to park the car for a few days and get properly into holiday mode ! Guido, the owner, is helpful and friendly and speaks excellent English and met us when we arrived. We would recommend staying at this property. Thank you so much Tim, it is a great satisfaction to read your comments and i truly hope to have you back in the future. Das Haus ist sauber, Betten gut, Schrankplatz und Sitzgelegenheiten großzügig, klasse Einkaufsmöglichkeit ganz in der Nähe; Küche könnte etwas ansprechender eingerichtet sein; Filterkaffeemaschine hat uns gefehlt, Außenlicht hat nicht funktioniert, auch Warmwasser gab es nur in einem Bad. Liegestühle sehr spartanisch. Also, uns hat es gut gefallen, schönes Haus, gute Lage, Preis/Leistungsverhältnis nicht angemessen, also etwas teuer für das Gebotene. Charmante maison à côté de la plage de Guidaloca. Au milieu des vignes, maison de 2 chambres, spacieuse et lumineuse, avec 2 terrasses. Très tranquille. Proximité d'une petite boutique/restaurant. Guido est un hote très serviable. 10 mins walk to the coast. Falcone e Borsellino International Airport. Booking Notes: 200 euros deposit. Changeover Day: Changeovers from Saturday to Monday.